For mobile developers, the ability to inspect their app is a crucial part of refining their code, and the app's overall usability. The new version of Appium continues to work on Windows and MacOSX platforms, and is now supported in Linux. So, no matter the kind of computer you have, you should be able to follow along as long as you have a server and an inspector running the last version of Appium. Simple: You can change the default host and port. Advanced: You can control general settings like log path, log level, node path, session, and timezone. You can change default bootstrap and Selendroid ports to a ChromeDriver port. Also, you can use Path for Android and WebDriverAgent for iOS. Presets: Is there any change you made and need to save for future executions? You can do that with this functionality. When you start the Appium server you can also see the log output, just like in the older Appium.app. 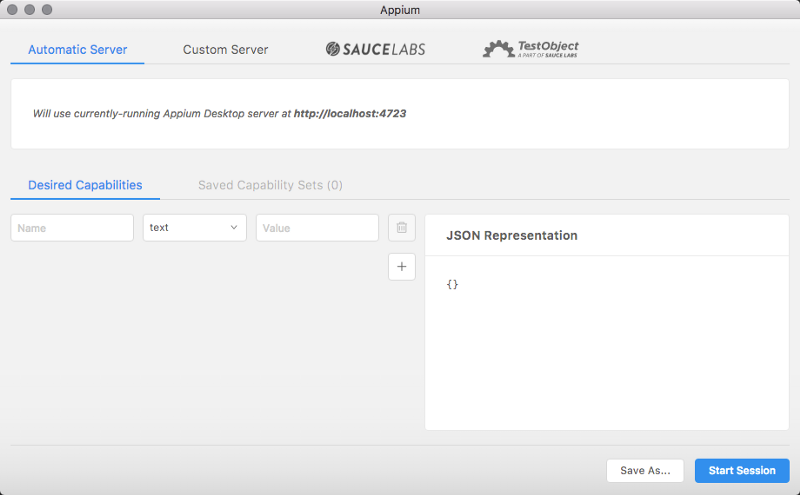 So, How Can I Inspect an App in Appium Desktop? You need to click on the Start New Session button after you start the Appium server. Automatic Server: You can add the Desired Capabilities to start any app and configure it in localhost. Custom Server: You can add Desired Capabilities to start any app and configure it in a remote host. Sauce Labs: You can start a new session over with SauceLabs environment. TestObject: You can start a new session over with TestObject environment. To start and inspect any app, you must set the Desired Capabilities by specifying the name and type of application (text, boolean, number, filepath, or JSON object). The JSON Representation will appear on the right side. These Desired Capabilities can be saved as presets (Save Capability Sets) and used for any of the options above (Automatic and Custom server, Sauce Labs, and TestObject). To start the session with your Desired Capabilities set, click on the Start Session button. After this, you are able to inspect any Android or iOS app. In the image below, I'm inspecting an iOS app. Now you'll be able to inspect an app with new the Appium Desktop!